The Personalized Learning Systems (PLS) Department will be hosting face-to-face trainings for LMS Champions, Secondary Educators, Beaudry employees and Options Schools Educators. Teachers continuously use progress monitoring to assess students' academic growth. To provide quantitative data for progress monitoring, teachers can print a Course and/or student Gradebook Report in Schoology. These reports along with informal data can be used to analyze student performance and guide instruction. 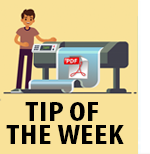 For tips, visit the "Tip of the Week" library. 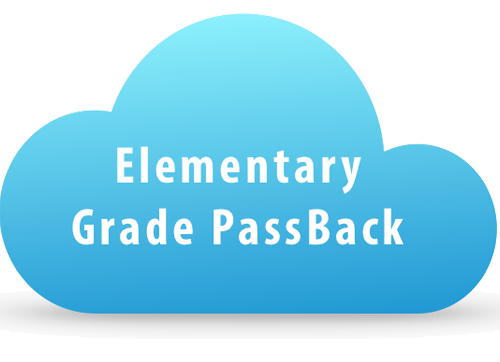 The Elementary Grade PassBack (EGP) app will use calculated grades from the Schoology Mastery Report to pass back grades to MiSiS. Several elementary schools will pilot the EGP app for the second reporting period. 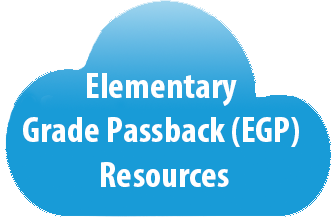 Visit the Elementary Grade PassBack (EGP) Focus Schools page for participating schools. Why a Learning Management System? 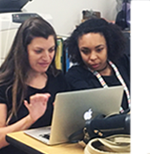 Schoology supports the District’s commitment to 21st century learning by equipping teacher with a robust digital tool that supports distance and blended learning opportunities. Implementing a learning management system will be key in preparing all students to be digital learners who use technology tools to graduate ready for success in college and careers. Do you have any suggestions and/or features you would like to see on the Learning Management System Schoology? 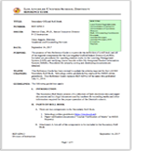 Please assist the Personalized Learning Systems (PLS) Department in giving your input and feedback. The elementary progress report policy is designed to develop a consistent, comprehensive system for reporting student progress. This includes measures for early identification of students at risk of not meeting grade level standards and for early systems of parent notification in accordance with California Education Code, Sections 48070 and 48070.5. 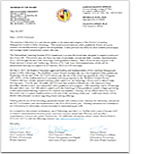 The elementary progress report is computerized and will continue to be implemented at all elementary school sites. 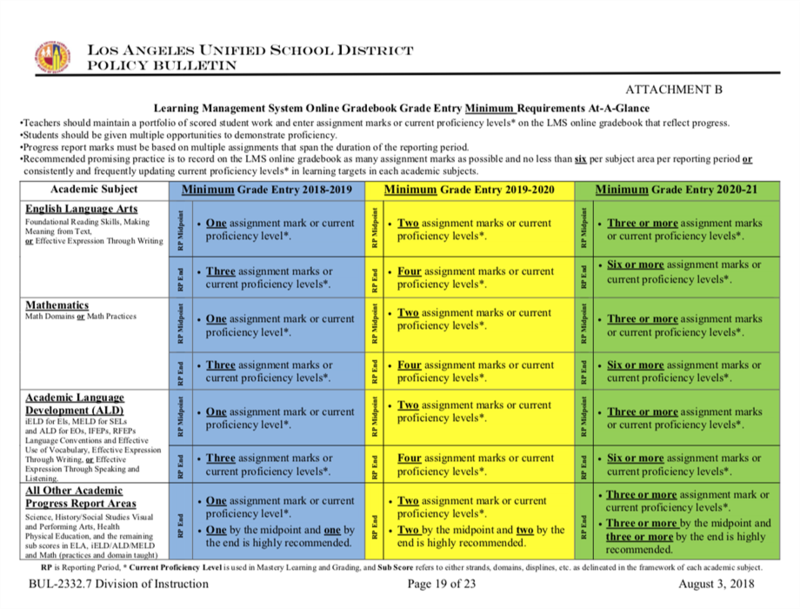 Attachment B from BUL-2332.7, The LMS Online Gradebook Grade Entry Minimum Requirements At-A-Glance, outlines grade entry requirements expected for 2018 - 2021. The purpose of this Reference guide is to provide the definition of an elementary roll book and all of its required components for the Los Angeles Unified School District (LAUSD). 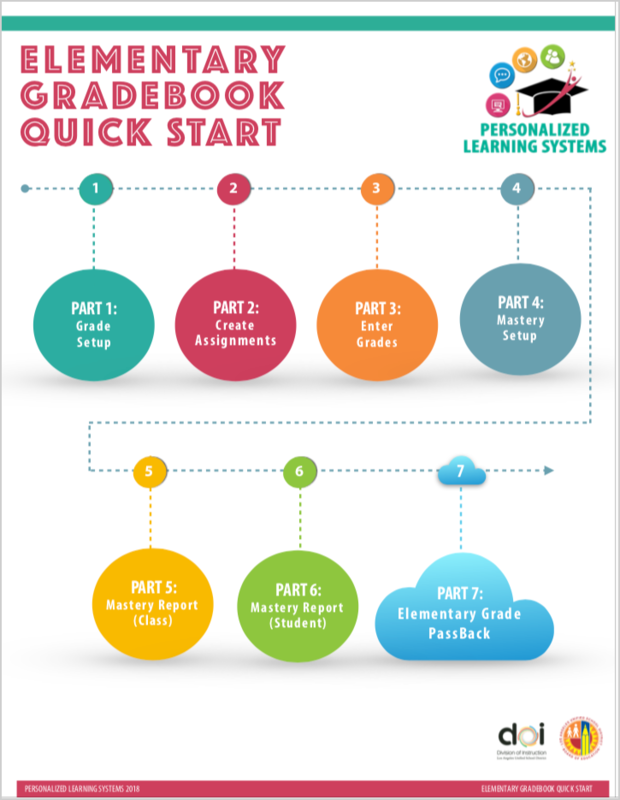 Included are procedures for inputting assignments and student marks in the Learning Management System (LMS) and certifying roll book records. Procedures for properly saving and destroying documents are detailed. The purpose of this Reference Guide is to provide the definition of a roll book and all of its required components for the Los Angeles Unified School District (LAUSD). 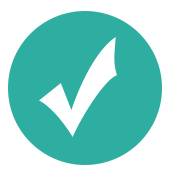 Included are procedures for inputting student marks in the Learning Management System (LMS) and verifying course records within My Integrated Student Information System (MiSiS).